We hope that you’ll take the time to browse around our site and get to know us. 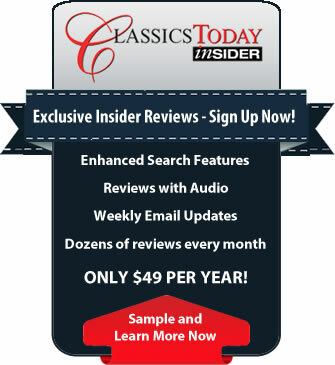 ClassicsToday.com prides itself on offering trenchant reviews backed by a clear, 1-10 rating system of both performance and sound. In addition to the new reviews posted each day, we also highlight a select group of the month’s best recordings: those that receive our 10/10 rating, as well as a specially selected Disc of the Month. Special feature articles include coverage of major reissues, artist interviews, comparative discographies, and thoughtful essays about recordings of special merit. Whether you’re a confirmed classical music record junkie, or just beginning your discovery of this vast musical legacy, ClassicsToday.com offers you the maximum amount of useful and reliable information in the clearest, most concise format possible. We’re here to help you make sense out of the often bewildering variety of classical music recordings, and our goal is simple: to help you locate and acquire the music you enjoy. The world of classical music is a wonderful place, full of beauty, emotion, drama, excitement and surprises. Join us, and let’s explore it together!